Pakistan's Navy classifies these ships as Destroyers, but at 3,500 tons displacement by modern standards they are more properly classified as Frigates, which was how they were classified in British service. In 1988, the Pakistani and UK Government set up a joint committee to explore future requirements during a low key visit of Lord Tref Garne, the then UK Minister of State for defence procurement. Discussion for the purchase of 6 ex-RN AMAZON class frigates began in 1992. 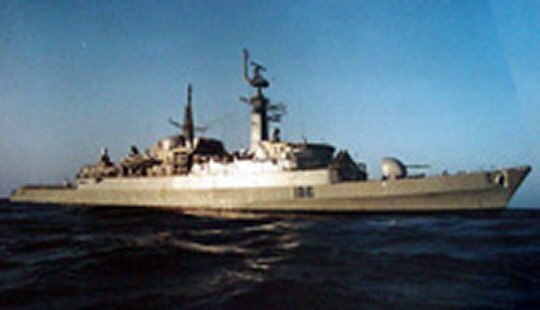 The Tariq class Frigates (ex-RN AMAZON class frigates) were acquired from the United Kingdom in 1993-94 in order to replace the Garcia class and Brooke class frigates which, due to the Pressler Ammendment, Pakistan had to return four Brooke (Badr)-class and four Garcia (Saif)-class frigates to the United States at the end of their five-year lease. The first Uk Amazon Type 21 frigate was turned over to the Pakistan Navy in July 1993 and arrived in Pakistan some four months later after a period of preparation work and training. The second purchased arrived in late 1993 and the last two in January 1995. Upon delivery, the first four underwent upgrade to equip them with the 9LV Mk3 command, control and communication system as well as Bofors torpedoes and, reportedly, the BAeSEMA-Thomson Sintra active towed array sonars. Currently Pakistan Navy operates 6 ex UK Type-21 Class Destroyers. The Type-21 ships were acquired from UK after Brooke & Garcia Class were returned to USA in 1991. These were formally inducted in PN from 1993 to 1995 and are the major surface combatants of PN since then. At the time of acquisition, the weapons and sensors were of old vintage and were not compatible with modern Naval Warfare trends, hence, a comprehensive modernization was carried out. As of 2008, all six ships remain in service. They have had their Sea Cat launcher removed, as well as the Exocets. Three of the ships had the Exocets replaced by the more capable Harpoon missile. In 2005, it was reported that a Chinese made LY-60 / FD-60 / PL10 (Hunting Eagle - Navy version) anti-air missile launcher was installed aboard the other three frigates by Pakistan. PNS TARIQ was named after a great Muslim conqueror TARIQ BIN ZIYAD. His conquest of Gibraltar led to the extension of Muslim rule of Europe. The life of TARIQ BIN ZIYAD is full of achievements, which are source of great inspiration to Muslims all over the world; sailors of Pakistan Navy are no exception. They take great pride in serving onboard their ship that has been named after one of the greatest leaders in Islamic history. The present PNS TARIQ (D-181), ex-HMS AMBUSCADE, is the third ship in Pakistan Navy to hold this name. This ship was commissioned as PNS TARIQ on 28 July 1993 at Davenport, Plymouth (UK). She was the first of the Type-21 frigates to be built by Yarrow Ltd. of Glasgow and launched on 17 January 1973. Commissioned as HMS AMBUSCADE into the Royal Navy on 5 September 1975, she was the seventh ship in Royal Navy to hold this name. Her career has encompassed all aspects of a warship's life from exercise to guard ship duties and from peacetime visits to the full heat of the war in the Falkland Islands. Present PNS TARIQ, being the pioneer of six Type-21's has been fully modernized in Pakistan with state of the art weapons and sensors. While being alive to the services rendered by her predecessors, PNS TARIQ is well poised to meet her commitments. PNS TARIQ has undergone a major modification with regard to her weapons and sensors. The ship is equipped with modern state of the art weapons, sensors and Command and Control system. PNS TARIQ is an ASW and AAW unit of 25th Destroyer Squadron of Pakistan Navy. The ship participated in LIMA 99 in November 1999 and was deployed for CMCP in 2004. The ship won the Efficiency Shield for the year 2003. 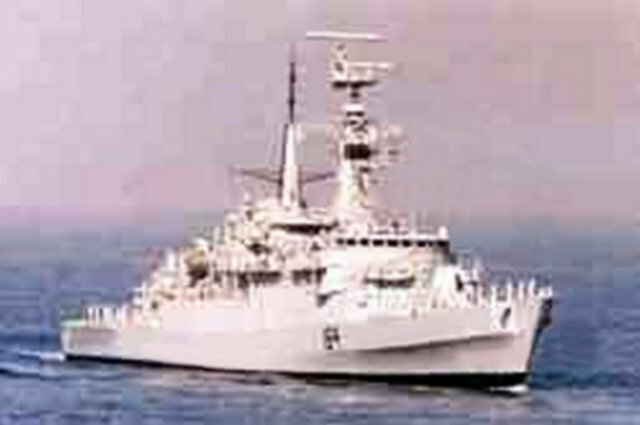 PNS TIPPU SULTAN is the third ship in the Pakistan Navy to have this name. The first one was an ex-Royal Navy 'O' class frigate which proudly served from 1949 to 1979 and fought in the Indo-Pak wars of 1965 and 1971. The second ship to take this name was an ex-US Navy Gearing class destroyer which served the Navy from 1979 to 1993. She is the youngest of the Type-21 class frigates built by the Royal Navy. First commissioned on 15 April 1978, she served as HMS Avenger in the Royal Navy before handing over to Pakistan Navy. PNS Tippu Sultan is part of the 25th Destroyer Squadron of the Pakistan Fleet. The mission of PNS Tippu Sultan is to maintain the standards of professionalism and excellence which are a hallmark of the Pakistan Navy. PNS BABUR (Ex - HMS AMAZON (F-169)) has been named after ZAHEERUDDIN MUHAMMAD BABUR, the founder of the Moughal dynasty, which ruled the Indian subcontinent for nearly three centuries. She was the lead ship of its class (Type-21 frigate) and was launched on 26 April 1971 at Woolston Yard, Southampton. 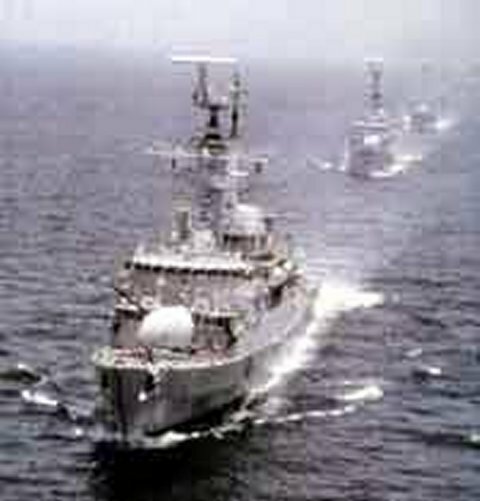 Traditionally, PNS BABUR has been the Flag Ship of Pakistan Navy and had distinction of being Flag Ship during the two wars of 1965 and 1971 with India. The Ex PNS BABUR (C-84) also spearheaded the famous bombardment on Dwarka in the 1965 war. PNS BABUR is a front line destroyer of the fleet at the moment with state of the art equipment, weapons and sensors onboard manned by highly worked up, professional and motivated personnel. The ship is designed to provide effective defence of a convoy or other force against attack by surface ships or submarines. It is a highly maneuverable platform owing to its gas turbine propulsion which can attain a top speed of 30 Knots in 60 seconds. PNS KHAIBAR derives its name from a famous battle in 629 AD during which the seemingly impregnable fortress of KHAIBAR was overcome by Muslim forces led by HAZRAT ALI under the guidance of Holy Prophet MUHAMMAD (PBUH). PNS KHAIBAR is the third ship of Pakistan Navy to be so named and was commissioned in 1994. The first was an ex-Royal Navy Battle class destroyer. The second was a Brooke class destroyer obtained from the United States in 1989. PNS KHAIBAR (Ex HMS ARROW) is the third of six Type-21 'AMAZON' class frigates acquired from UK. These ships were basically designed as ASW frigates. However, they have been modernized by PN to combat effectively in all dimensions of modern warfare. Ship is primarily equipped for AAW and ASW operations with limited capability of anti surface operations. PNS BADR(Ex - HMS ALACRITY (F-174)) is one of the frontline surface unit of PN which is equipped with modern weapons and sensors to effectively operate in multi threat scenario. Ship has participated in all sea programs with alacrity.